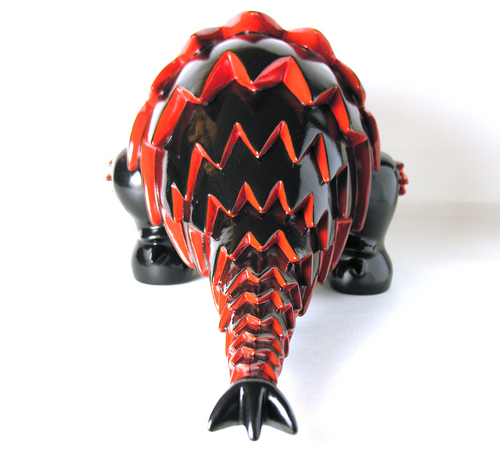 A top-flight rock poster artist, Jermaine Rogers first stepped into the designer toy world with Dero from STRANGEco -- a menacing bear-like creature with red eyes and razor sharp teeth. Rather than simply dreaming up interesting characters for his posters, Jermaine weaves a storyline which ties them into a larger universe of struggle and deceit. ”I was made to be unfeeling. A machine. We were bred as a workforce toward Dero ends. We were given no names, only numbers. I am called ‘129’. This was sufficient. I have been worker, henchman, butcher, hunter and terrorist. And now I am ‘traitor’. There is a dangerous game of rebellion being played beneath the world, Vincent. And my hand weighs heavily in it..."
Previously released in a special black Shadow edition at SDCC '06, Veil: Specimen 129 was recently released by STRANGEco in bright pink. While sharing visual traits with their masters - the Dero, they tower over them. The Veil: Specimen 129 figures stand at 11" tall while Dero measures a mere 7" high. 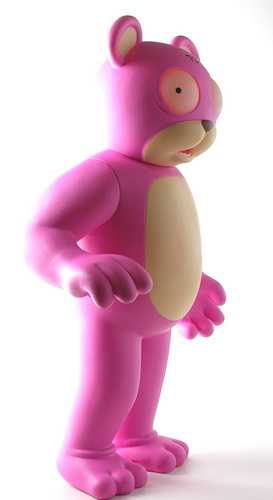 The pink edition of Specimen 129 reviewed here, is limited to 900 pieces. Both figures have three points of articulation - at the shoulders and the neck. As with the Shadow edition, the pink Veil: Specimen 129 has a deceptively simple appearance from the front -- a long legged bear-like character with large glow-in-the-dark eyes. The micro-chip protruding out of Specimen 129's head serves to put us on notice that all is not as it seems. Additionally the '72' emblazoned on the forehead raises the obvious question of what it all means. The distinguishing design feature of this edition is clearly the hot pink 'skin' color. 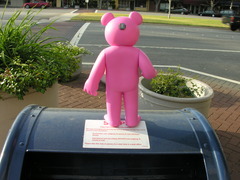 While the Shadow edition is menacing in black, Specimen 129 takes on new life and meaning in pink. Black is perhaps too predictable, yet Pink is an unexpected choice. Stereotypically, Pink reads as safe or at the very least not threatening. What to make of a pink Specimen 129? Perhaps a kinder inner soul or perhaps an enigmatic message as to 129's intent and nature? While the truth is currently known only by Jermaine Rogers and Vincent Vangogh, the fact is that for this reviewer the pink Specimen 129 is intriguing because it poses more questions than it answers. Veil: Specimen 129 comes in a retro style two-piece black box with teal detailing and lettering. An excellent illustration covers nearly the entire front panel. The side panels feature 129's previously mentioned quote to Vincent Vangogh and the "resist" 72 logo. The sharp looking box compliments the figure nicely, bringing Jermaine's artwork to the forefront. Since this is a 'review' -- you're probably expecting some sort of judgment or verdict ;-) Veil: Specimen 129 has a subtle yet powerful design made more compelling by the slowly unwinding mythos that links the Veil and the Dero together. Quality wise there is little here to complain about. Considering the figure stands 11" tall , is limited to 900 pieces, and has GID eyes it offers strong value at a suggested retail of $49.95. So where do things go from here? After unleashing powerful Jedi mind tricks over IM, here's what we know for certain. STRANGEco will release additional Specimen 129 editions in '07 including a special collector's edition only available directly from Jermaine Rogers. Also, be on the lookout for a new figure from the Dero/Veil narrative. Stay tuned for further details. Patrick Ma's Insurgents Wilderness Gruppo (I.W.G) from Rocket World is a clever and timely concept -- anthropomorphic animals taking up arms and military tactics to punish 'bad humans' who have endangered earth's ecosystem. The I.W.G. line started with mini-figures and expanded into larger figures including several recent releases. After a lengthy development process, STRANGEco has released the I.W.G. Rocketship -- a 19" interplanetary transport for the intrepid I.W.G warriors. The retro themed I.W.G. Rocketship comes in three colorways - the Future Eco-Green Edition (450 pcs), Classic Galactic Silver Edition (450 pcs), and the very limited Force Recon Covert Black Special Edition. The I.W.G Rocketship comes with a bonus mini I.W.G. 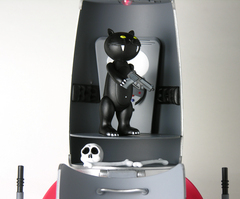 figure -- Taharaka the Rhino (Eco-Green) or Huey the Black Panther (Galactic Silver). The Force Recon Covert Black Special Edition comes with both figures. For this review, we evaluated the Galactic Silver Edition. The I.W.G. 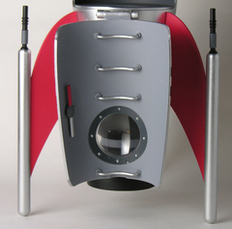 Rocketship is well-designed with a distinct retro vibe. 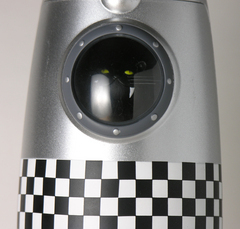 The classic curved fins end in laser canons and also bear each ship's edition number. 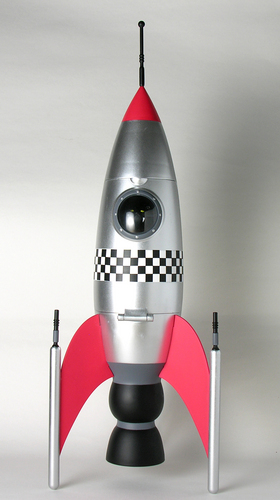 While the toy can be appreciated as a static rocket, it is also a capable 'playset'. Peering through the sweet porthole window one can see into the cockpit. Pulling down the hinged door reveals a ladder on the inner side of the door as well as the spacious cockpit and storage area. The detail of the door both inside and out is executed perfectly and really adds a welcome sense of technical intricacy to the design. The cockpit is large enough to hold 2-3 mini figures comfortably. The control panel is complete with a rotating steering wheel. The storage area, a circular space below the cockpit, is used by I.W.G. operatives to store the remains of 'bad humans'. 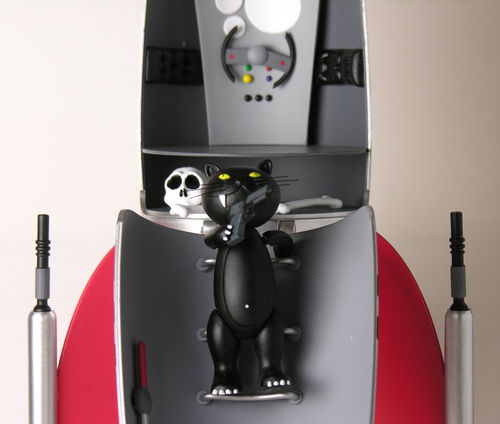 Conveniently, each Rocketship comes with a skull and two human bone accessories. Next, we come to what many will feel is the headline special feature. The red LED light on the cockpit ceiling rounds out the interior. A counterclockwise 1/4 turn of the antenna engages the light which while a bit dim, definitely adds to the mood and the overall value of the toy. The inclusion of the light and the clever switch (which doesn't appear to be documented) is a sure sign of Patrick Ma and STRANGEco's commitment to deliver a superior product. Though I'm not sure how practical it is when viewed from a collector's perspective. The Galactic Silver edition comes with a bonus Huey the Black Panther mini-figure complete with a rather large side arm (all the better to dispatch bad humans). Huey is quite the stealthy warrior. The facial details are quite nice -- especially the whiskers which were unexpected and quite cool. The I.W.G. 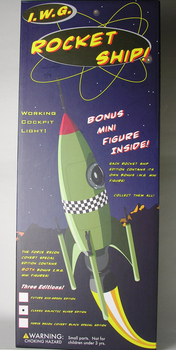 Rocketship comes in a large retro-themed matte box which clearly pays homage to toy packaging from the past with it's exclamations -- "Working Cockpit Light!" and "Bonus Mini Figure Inside!". 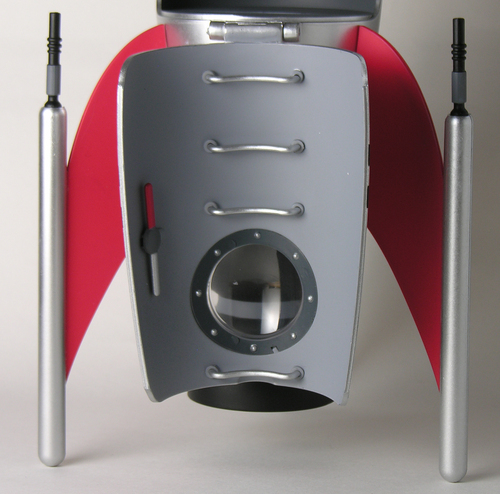 The side panel details the role of the rocketships in the I.W.G. universe with the signature delicious prose drenched in the over-the-top detail and sense of gravity, that accompanies all I.W.G projects. Due to the structural limitations of vinyl, the Rocketship is made out of hard plastic. 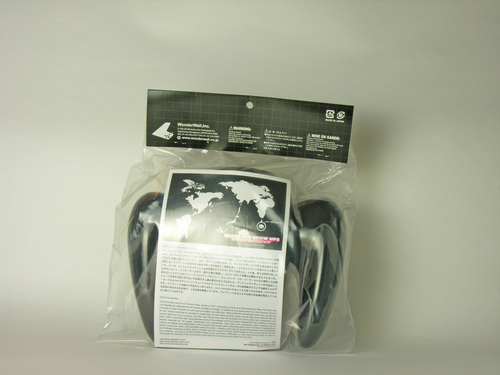 The use of hard plastic is a necessary yet unfortunate concession as the physical feel of the I.W.G. Rocketship and other similarly constructed toys) is, in my opinion, inferior to the nice tactile touch and weight of vinyl. Overall the construction is sturdy though the fins could stand to be slightly more rigid. The paint application is of fairly high quality though there does seem to be some variability from piece to piece. The shiny silver hull shows some minor discolorations in spots. The checkered band that rings the ship is fairly uniform with decent registration. The I.W.G. logo on rear of the ship is spotless from what I've seen. Finally, we come to the dual natural of the I.W.G. Rocketship. It's both a limited-edition collectible and a functional playset. As a playset, it excels with a strong design and several cool features including the large hinged door and the working LED light. As a collectible designer toy, things are a little less clear. On one hand, the rocketship makes a cool display for I.W.G and other mini-figs. On the other hand, I feel this tension between designer toys and more mainstream toys which often have available playsets. 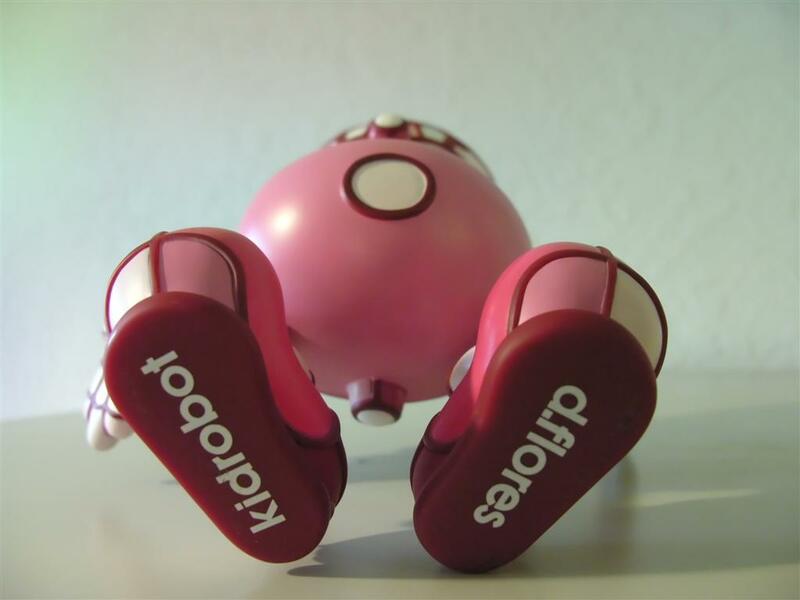 In my mind, designer toys are special partly because they subvert what mainstream toys are about. If one recognizes designer toys as affordable and collectible art pieces, then the issue of play features becomes a little murky. While many collectors desire articulation -- I think it's reasonable to suggest that many pose the figure once or very infrequently for static display rather than play with it on a regular basis. Play certainly isn't bad, far from it. The question is, when does a designer toy start to feel like a more mainstream toy and thereby lose some of its subversive appeal? There's no easy answer -- and like everything else this is ultimately a matter of personal taste. Overall, the I.W.G. 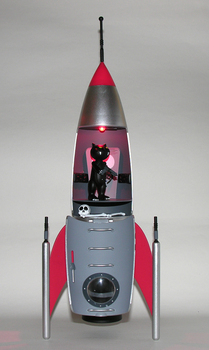 Rocketship is a well designed and well-executed toy and certainly a welcome addition for many I.W.G fans. It offers good collectability at only 450 pieces each for the silver and green editions. The $99 suggested retail price is nicely offset by the large size (18" high), cool extra features (most notably the LED light), and the inclusion of the bonus figure. Go Hero recently released Yira: The Dragon of Doom, the third retro-japanese themed figure in the company's Mechabot universe (following Mechabot and Tentkill). We first saw Yira roughly a year ago at Toy Tokyo's Toy Fair '06 booth and were impressed from the first encounter with its sense of presence. This is an imposing figure standing nearly 7" high and and 17" long (1:32 scale !). The armor scaling running the full length of the body adds to the sense that one is looking at an instrument of death and destruction. Vinyl Pulse received the standard metallic black and red Yira (limited to 250 pcs) for review. First impressions can be quite powerful and telling. Upon opening the mailing box and freeing the dragon from his bubble wrap cocoon, I placed it on the table and stared for quite a while. At the risk of flirting with hyperbole, this figure commands attention -- due to its sheer size and hard-boiled streamlined design. Perhaps more than any of the other colorways (with the exception of the lovely Flame variant), the black and red brings out the dark and powerful core of Yira's being as designed by Steve Forde. The shiny metallic black paint application is quite nice with tiny sparkly flecks that really have to been close up to be appreciated. 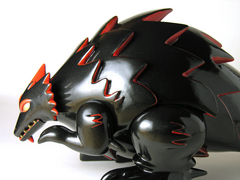 Bright red highlights the edges of the scales and is also used for detailing throughout. 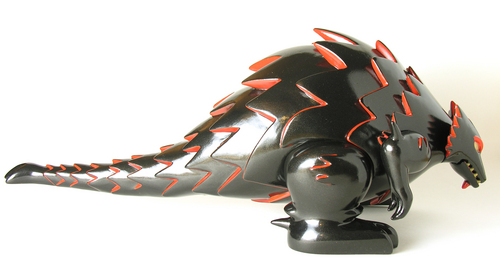 Besides the black and red edition reviewed here, Go Hero has released several other limited colorways including Flaming Rage (50), Black and Silver (50 - split between SURU and Kaiju Taro), Bioluminesecent Glow (50), Pearlescent White/Silver White (50 - Toy Toyko), and Gojira Green (50 - Kidrobot). Upon picking up the figure, the first thing you notice is just how solid it feels. While Yira is rotocast vinyl, its shape plus heft had me drawing late-night comparisons to bludgeoning weapons (vinyl mace anyone?). The other image that comes immediately to mind is of a small pet. Yira proves that size does matter. The only (minor) downside to the size is that Yira just barely fits in the ubiquitous Ikea Detolf and only if you place it diagonally. 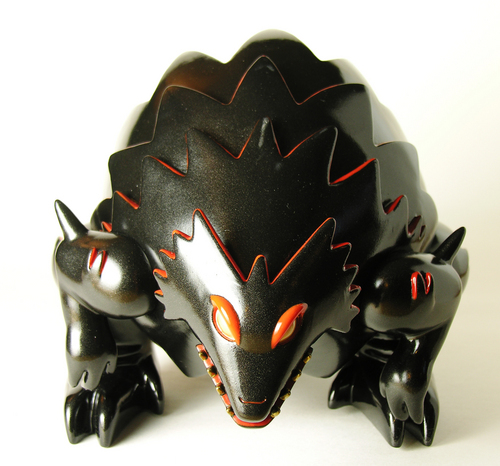 All in all, yira is an excellent figure with an imposing original design from Steve Forde and high quality throughout. As somewhat of a nit, I would have liked to see Yira come in packaging (rather than bubble wrap and a simple yet nice neck tag). 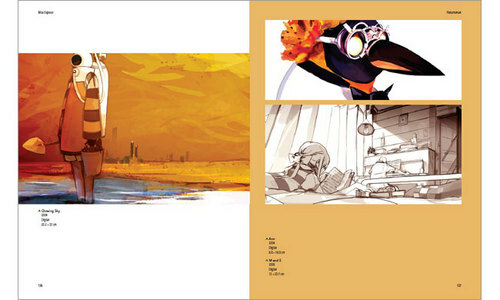 The traditional bag and header card would be rather cumbersome given Yira's size, so a slick box perhaps. On the big plus side, the black and red Yira has a suggested retail of $60. Given the large size, $60 seems like somewhat of a bargain. Even without pad printing, the pricing for a toy of this size makes us scratch our head at some of the pricing we're seeing on newer relatively small figures. Yira is a recommended buy for the nice original design, imposing size, good execution, and strong value. Since the excellent Artist Series, fans of the MAD*L have been eagerly awaiting another release of MAD's signature figure. 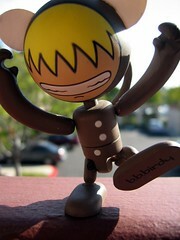 The wait is over with yesterday's release of the ATP MAD*L designed by MAD and produced by Wheaty Wheat. So is it as cool as it looks? Here's our review and it's in time to actually help you decide (imagine that!). Designed for MAD's Invasion exhibition at the All Tomorrow's Parties (ATP) Winter event, this figure features a happy-go-lucky character with trippy hypnotic eyes and a humorous t-shirt graphic. The character's wide grin extends from the left side of the head all the way across to the right side of the head -- happy indeed! This challenging design feature is rendered well with a very clean paint job. The "shirt" reads "I got this Dope Fig @ ATP '06" in MAD's bubble script and definitely puts a fun spin on memories of those dreaded "So and so went to (fun place) and all I got was this lousy t-shirt". The design is completed by blue stars of various sizes which cover the entire fig ('cept for face and shirt). This is a fun figure driven by the pared-down crisp graphics and nice characterization. It exudes happiness right down to the main feature -- a GID blue body! 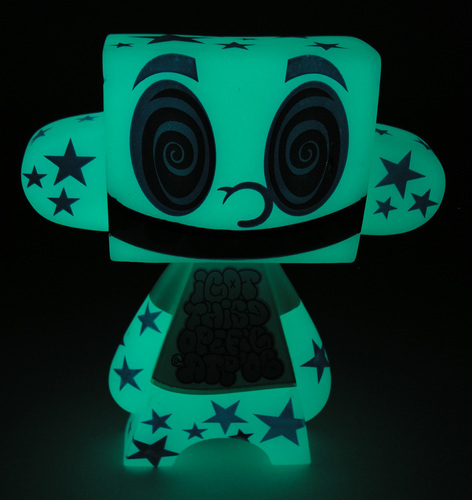 While colored GID doesn't work quite as well as the standard white/green classic treatment, this one is fairly bright. 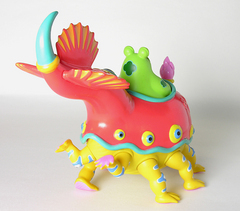 Jim Woodring draws amazingly creative rainbow-hued creatures. 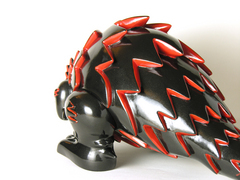 His creations are deceptively simple in their seemingly wild mix of various body parts. At first, eyes, arms, legs and more of his creatures come together as if their creator in a fit of whimsy has taken the Twister approach to their genesis. Hardly the case. Jim's creatures have a presence and poise that comes from his talent of meshing improbable combinations into wildly imaginative beasts possessing rare beauty and charm. 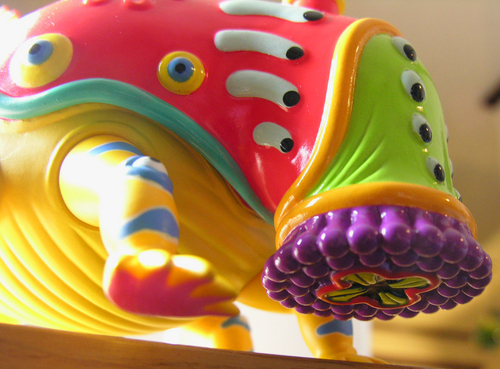 Through his partnership with STRANGEco, Jim Woodring has given birth to several vinyl figures. 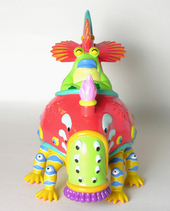 Most notable is Dorbel -- the first toy produced by STRANGEco. Woodring's touch with Dorbel is restrained yet effective. While retaining the easily recognized Japanese lizard monster shape, Dorbel sports a brightly colored face and a spiked tail with multiple eyes. If there is a gripe about Jim Woodring's toys it boils down to this -- the long wait between each dose of colorful vinyl addiction. Good news -- Woodring fans. The wait is over. First unveiled at this year's Toy Fair way back in February, Mr. Bumper has just been released by STRANGEco in limited quantities for the holiday season (ramping up availability with the new year). 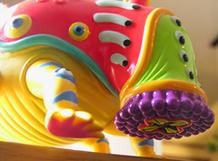 Ever since we spotted Mr. Bumper in STRANGEco's Toy Fair booth, we've been looking forward to his release. At first glance Mr. Bumper appears to be a green frog-like creature riding in his bright red (forthcoming alternate colorways will feature different covered cowls) vehicle driven by the power of eight yellow feet. The exterior of this conveyance meshes brightly hued organic elements into an overall design that clearly evokes automobiles of the past from the large rectangular "grill" to the actual aquatic like fins that punctuate the tail end. Clever design often reveals itself by turning first impressions and glances into second and third look-overs followed by a slow yet excited "ooh". So too is the case with Mr. Bumper. All along the exterior we see grommets, vents and ports which upon closer examination are eyes -- on the grill, along the grill "vents", running all along the "trim", on each of the eight knees and finally the largest and perhaps most deceptive of all on the tail - so large that it appears to be a domed hatch. 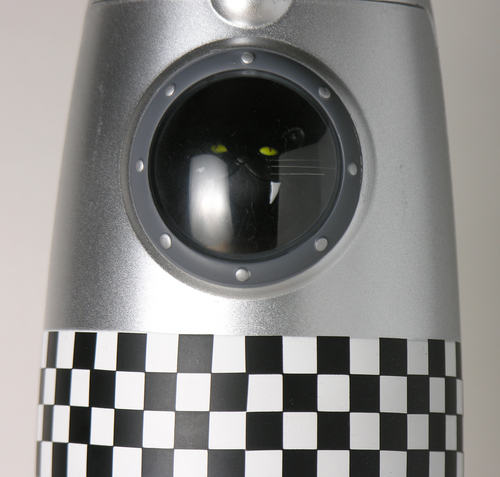 With out a doubt Mr. Bumper has his eyes on you, but have you been looking carefully enough? I still remember the "whoa" moment as STRANGEco's Jim Crawford lifted off Mr. Bumper's cowl to reveal the regal creature underneath which was followed quickly by the "so it's not a vehicle" head scratching moment. The removable cowl is clearly the height of Mr. Bumper's deceptively clever design. 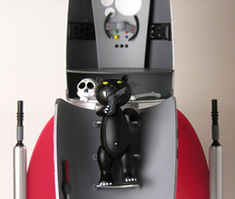 In comparison to the prototype shown at Toy Fair, thankfully very little has changed. The amazingly glossy coat on the cowl has been toned down but thankfully preserved. I may be in the minority on this point, but certain designs scream out for glossy vinyl to break the doldrums of one matte vinyl figure after the next. The cowl is really slick -- heavy and solid yet clearly soft rotocast vinyl. I can't think of a comparable "accessory" -- the closest would be the vinyl poncho on Tequila which while excellent does not have the sheer mass and sculpting complexity of the cowl. On top of the shape and construction, the paint job is very well-done -- superior to most of the paint jobs and finishes seen on designer vinyl today. While this might sound like pure exaggeration and perhaps to a slight degree it is, the cowl almost feels like something that shouldn't be possible, perhaps only because it seems unprecedented in scope and execution. Finally, one last surprise and excellent detail is revealed by looking under the front edge of the cowl -- sculpted mouths rather than a simple flat colored design. The underlying Mr. Bumper figure is more muted in color but carries the same high quality paint execution as the cowl. The front chest area is adorned with ornate decoration. With the cowl on, Mr. Bumper is sleek and modern, without it -- regal and perhaps pompous with crossed arms and a smug closed eye pose. 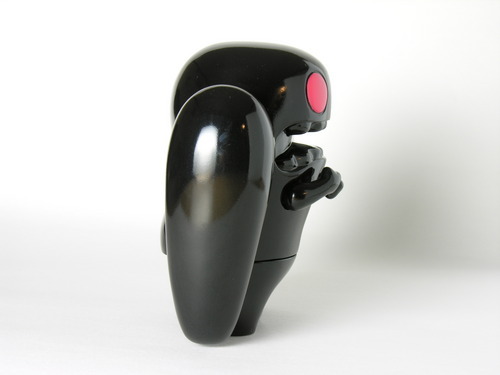 Each of the eight legs are articulated however Mr. Bumper relies on the front 3 on each side in order to maintain an even flat-footed appearance and pose. The back two legs dangling in mid air offer the most practical posability with poses ranging from a power gallop to almost a hands outstretched pose. Finally we come to the box which reminiscent of retro toys features a top half which fits snugly over the bottom half. 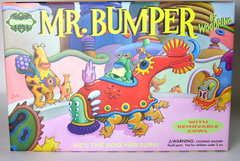 The top panel of the box carries a bright pastel colored illustration of Mr. Bumper out for a stroll followed by another similar yet different creature (please... pretty please !?!?). The retro box is a nice touch which puts the finishing touch on a unique and excellent offering from Jim Woodring and STRANGEco. 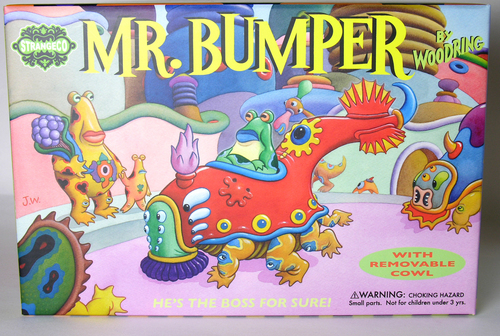 In our opinion, Mr. Bumper is one of the finest designer toys released this year -- without a doubt. 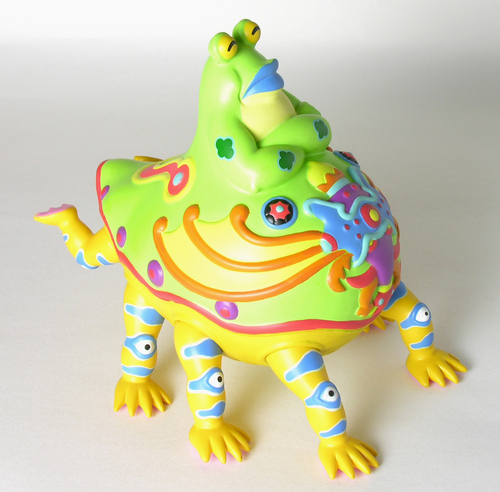 From Jim Woodring's wildly imaginative organic design to the excellent execution, this is a toy that reminds us why we started collecting designer vinyl and also demonstrates that uncompromising original art toys have little equal. As we put an end to this much too-long interview, we come to the issue of value. 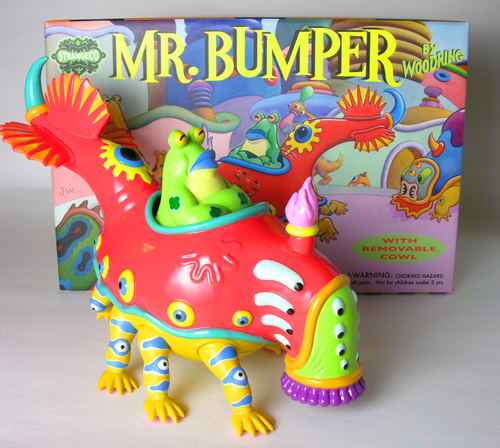 Mr. Bumper is priced at a very reasonable $60 considering the overall quality as well as the size, nearly 6 inches tall and 10 inches long. Our recommendation -- if he appeals to you at all (and how could he not ;-), buy Mr. Bumper without hesitation. Written and edited by Althea Chia, Bliss Express: illustrating happiness presents twenty-one artists takes on the enigmatic and ethereal nature of happiness. 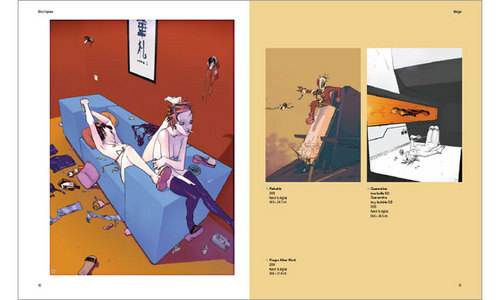 Featured artists include such notables as David Choe, Seonna Hong and Yumiko Kayukawa. 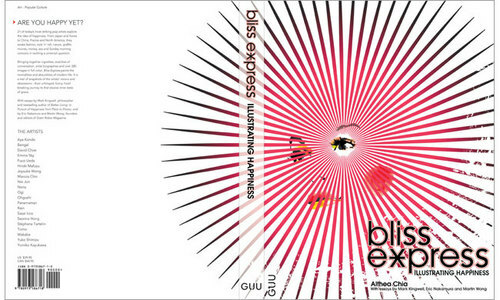 Bliss Express offers two introductory essasys one by Mark Kingwell, author, Professor of Philosophy at the University of Toronto, and astute observer of cultural practice and the other by Eric Nakamura (founder) and Martin Wong (co-editor) of Giant Robot. Kingwell's examination of happiness focuses a laser beam on society's insatiable and perhaps futile quest to manufacture and sell happiness to the masses. Eric Nakamura and Martin Wong make the point that happiness for artists starts with the freedom to express themselves without worry of pleasing an editor, sponsoring patron or other commercial interest. As they label it, indie art, is about blurring the lines between high culture and pop culture -- a much more welcoming, inclusive and deeply personal approach to art than perhaps what has preceded it. In my quick, brief and definitely incomplete introduction to art books -- there seem to be at least two major approaches -- present the art in a handsome well-designed volume and let the art speak for itself or provided running commentary and analysis more or less on a piece by piece basis. Bliss Express offers a pleasant hybrid -- the presentation of each artist's work begins with a vignette coalesced by Althea Chia from her back and forth communication with the artist and is sprinkled with the artist's quotes on happiness. The vignettes are effective in provoking a reflection on happiness because they recollect fragments of experience with a minimum of commentary or judgment. 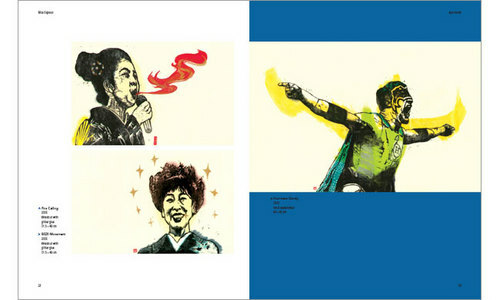 The quotes helps to provide a sense of identity to the artist behind the excellent art collected in the book. In a very real sense, Bliss Express presents an introduction to 21 artists from six countires -- each given ample space to display their personality through art and words. Perhaps it's a personal fault but I often worry that a good thing will come to an end rather than appreciating it in the moment. Thus, it's reassuring that each artist's section spans many pages and does not leave viewers (at least this one) wanting. The range and variety of aesthetics presented in Bliss express is welcome and bound to ensure that almost anyone who has even a passing interest in art will be able to quickly pick up the volume and find something enjoyable or stimulating. 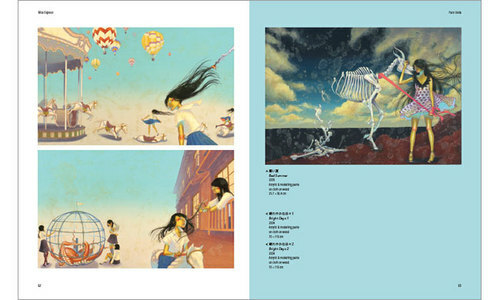 As well it serves as an excellent introduction to "indie" art with an illuminating focus on a rising core of asian artists. Bliss Express: Illustrating Happiness is available now in a full-cover 224 page hardcover volume directly from the publisher, Guu Press, with a suggested retail of $39.95 ($54.95 Canadian). The mysterious Mothman is everywhere, in the shadows and in the midst of many of David Horvath's drawings. In fact, he seems mildly obssessed with the creature. 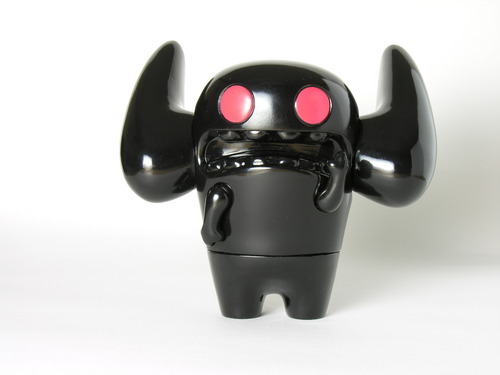 The question is should you be obsessed with the 5.75" tall Mothman vinyl figure, the latest released in the cool Kaiju for Growup Series from Wonderwall ? 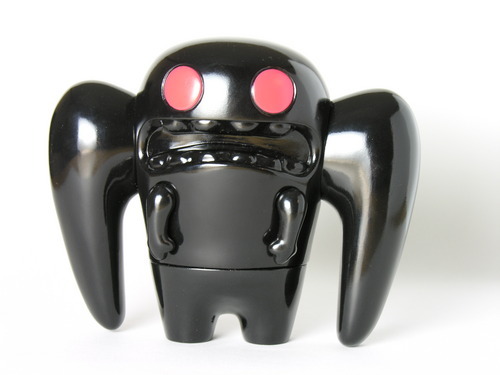 If you're counting, Mothman by David Horvath is the third in the series following Frank Kozik's Ika Gilas and Touma's Maguman. 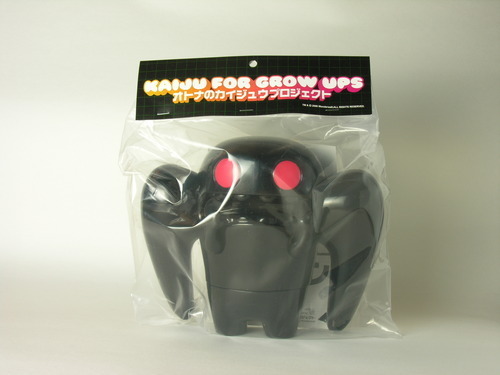 As with the other figures in the series, Mothman comes in the traditional kaiju packaging which means a header card and clear plastic bag. It's good to pay tribute to one's roots. Once you free Mothman from the confiment of the bag, you'll notice that he's... GLOSSY. Most opaque vinyl produced today has a matte finish. Occassionally you'll see a glossy proto but by the time the production pieces roll around glossy has become matte. While there's certainly a place for matte, the high gloss finish looks great on Mothman and it's nice to see the alternative finish out in the 'wild'. 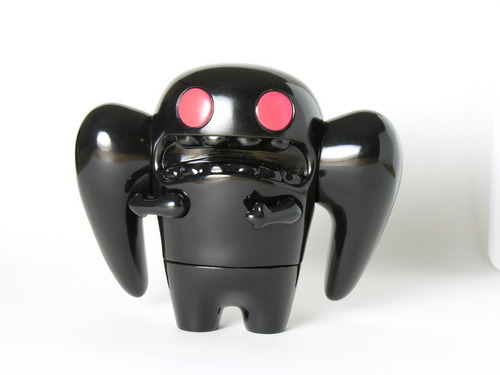 While I'm rambling on about the material, Mothman is 100% Japanese vinyl. It's hard to put into words, but Japanese vinyl seems to feel better than the much more common Chinese vinyl. Or maybe I'm just falling prisoner to the mystique ;-) What I do know is that it's just a tad softer than most vinyl that has printed designs. I consider this a plus as it lends a nice feel. In my opinion, toys should look cool and feel cool as well. The Eye Witness Type is my favorite colorway so far with the always powerful red and black color scheme. 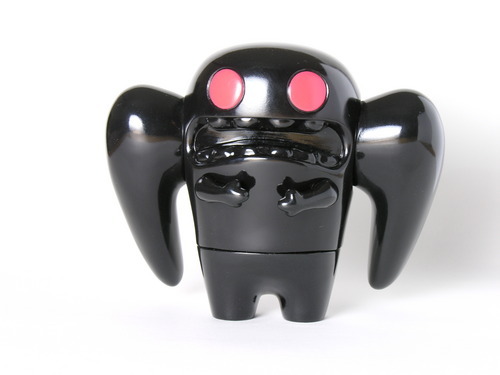 More importantly, it's what I expect Mothman to look like -- jet black with piercing red eyes. So what's the verdict? In my opinion Mothman is one of the nicer original figures released this year. The sculpt looks great and also manages to squeeze in lots of articulation without hindering the shape. You've probably made up your mind in terms of the design and 'look' of the toy. I can confidently say there are no hidden drawbacks or flaws with this figure -- the kind you'd only discover after buying a toy. No such worries here. It's well made and sculpted. The paint job while simple is excellent and the figure is quite stable (though it's possible to upend him with both wings straight forward). 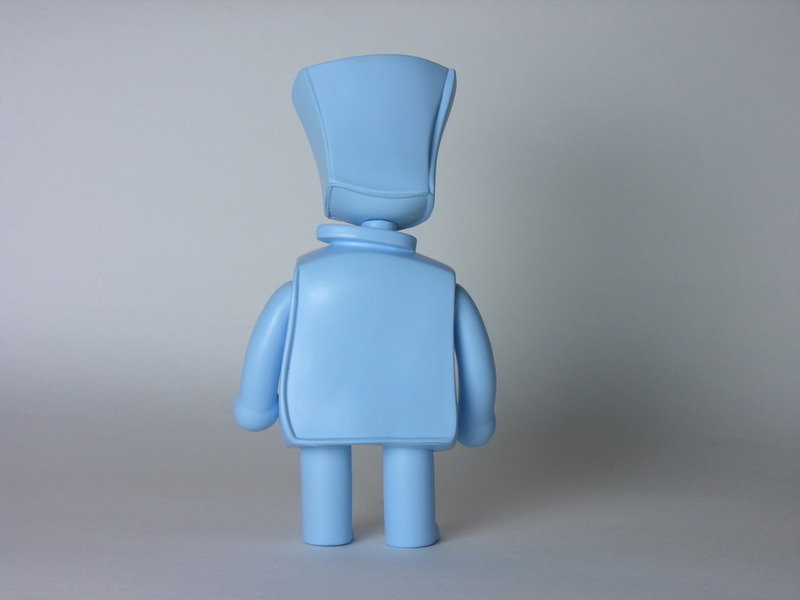 Genshi:Toy founded by Craig Anthony Perkins is a newcomer to the designer vinyl toy scene. 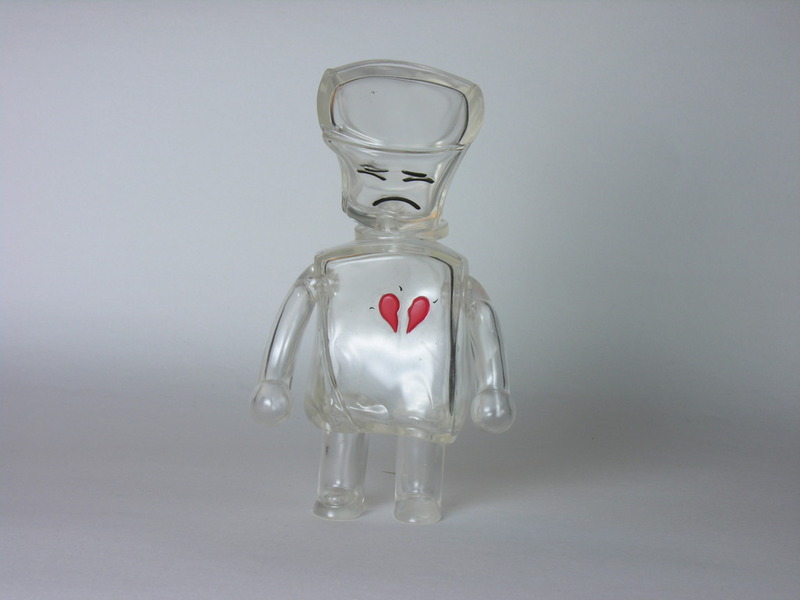 Broken Heart Robot is Genshi:Toy’s first vinyl toy. 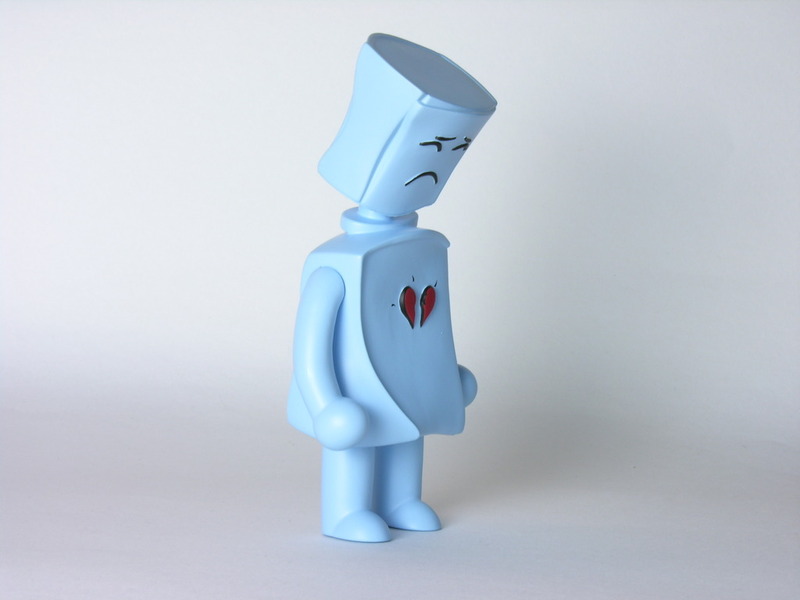 I’m sure you have read the story behind this sad robot, if not, just check out the website to learn more. 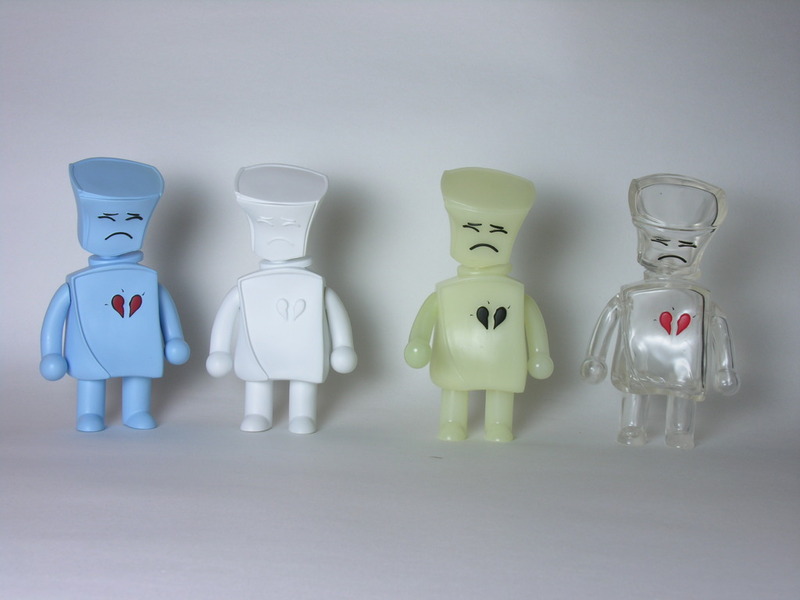 Broken Heart Robot comes in four colorways, Standard Blue, Glow-in-the-Dark, SDCC Exclusive Clear and finally a Blank edition. Let's first talk about the design. 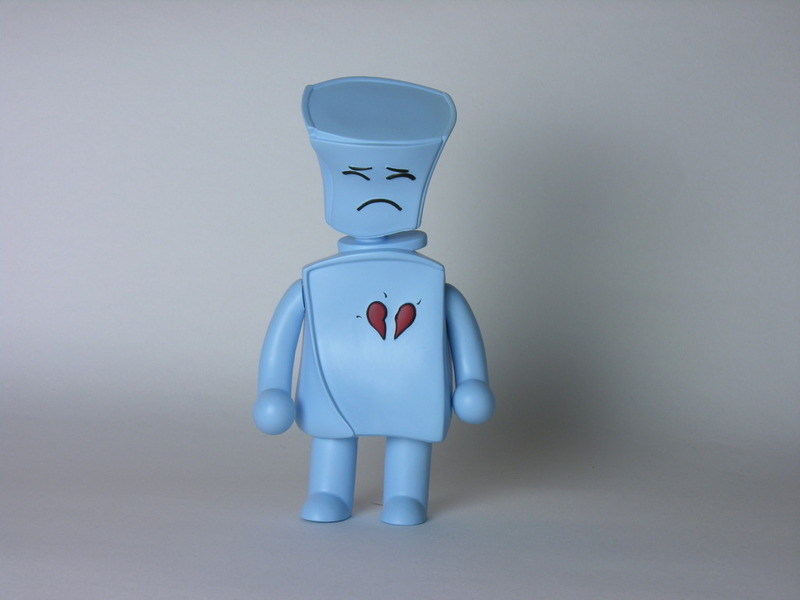 This toy is simply sketched with a pained facial expression and what else?? ?….a broken heart on his chest. 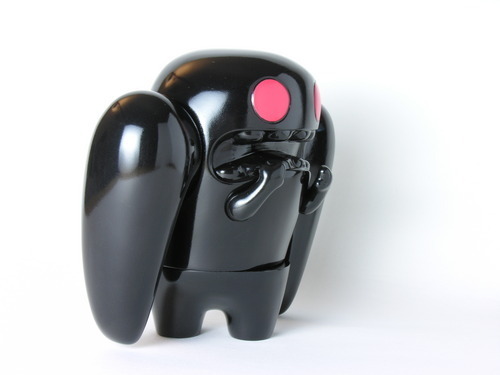 The toy’s simplicity and straight forward feel makes up the lack of extravagant details. The shape takes on a more interesting turn. The twisted head with a peculiar flat top is slightly bent forward as if trying to conceal possible tears. The pudgy body finishes up the shape. 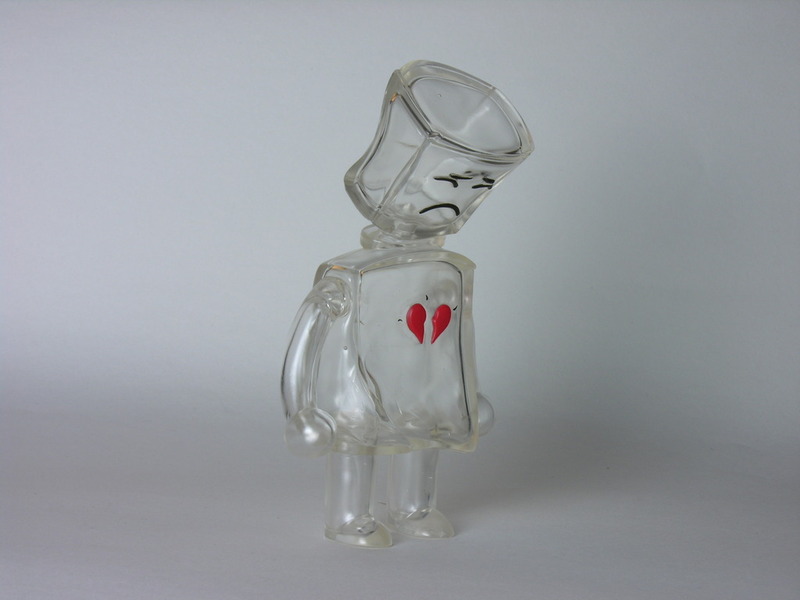 Despite a slight flaw in the uneven legs, the 6" tall Broken Heart Robot stands quite firmly. With four different colorways, many people are bound to have a favorite. Mine? The Blank edition which has lots of creative potential. 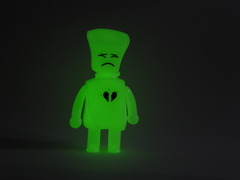 The Standard and GID Broken Heart Robots are available in stores and retails at $39.95. 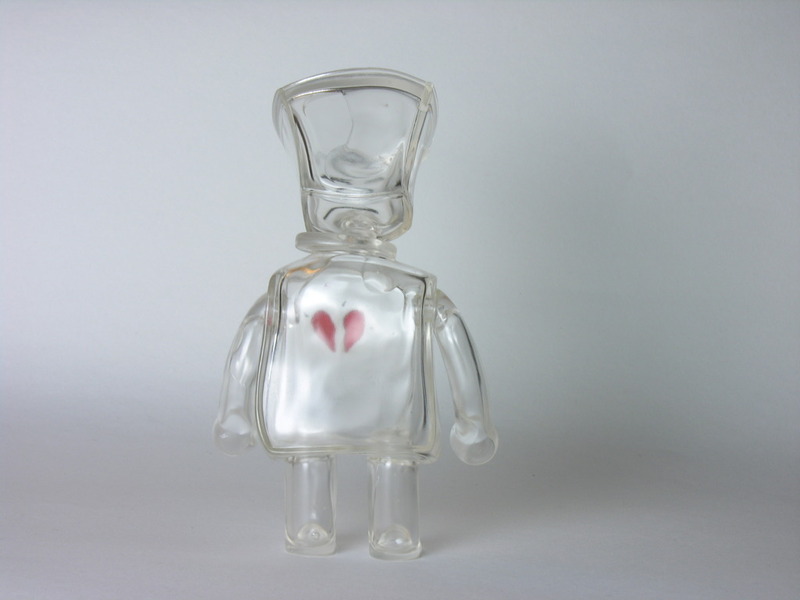 The Blank Edition is only available via Broken Heart Robot's website and retails for $49.95. 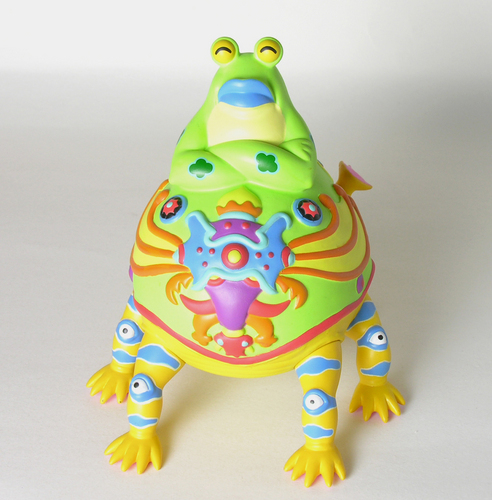 Stay on the look out for Craig's next toy, Kricky the Alien Frog. Dave Flores is well-known for his portraits of celebrities and renderings of cultural icons. His unique art style involves crisscrossing curved line segments that almost remind me of the metal structure found in stained glass work. 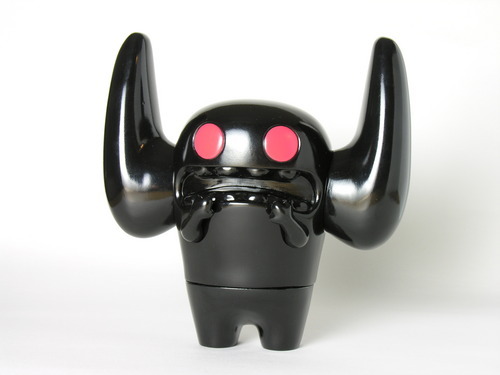 Kidrobot and Dunny collectors have already gotten a taste of Dave Flores in designer toy form through the recently released Evil and Bad 8” Dunnys. Today, Kidrobot is releasing the first colorway (red) of its original Dave Flores Figure, Kon Artis. 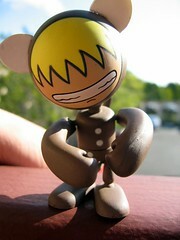 While Kon Artis follows his previously released Dunnys, it has been in development for quite some time. 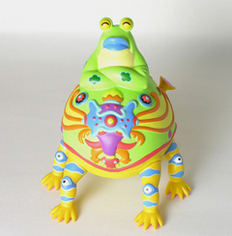 In fact, it was shown at last year’s Toy Fair in unpainted prototype form (2005). The figure is based on Dave’s paintings of America’s most beloved (or is that loathed) Mouse. 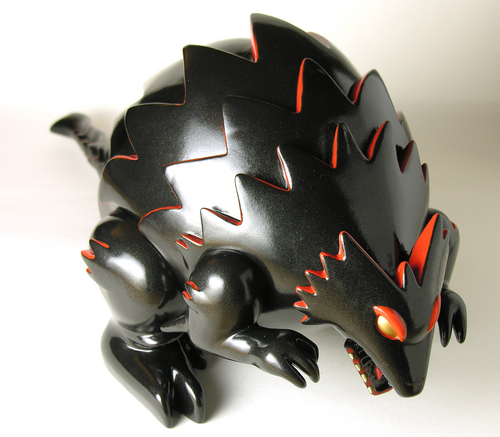 Standing about 8.5 inches tall, Kon Artis is a very striking figure. After unpacking it, I stared at it for quite a while enjoying the figure from various angles. This is without a doubt a great sculpt and a very appealing figure. Perhaps not completely surprising given the source material, Kon Artis feels like a cartoon character come to life. Dave Flores’ art style makes the jump to 3D quite nicely here. 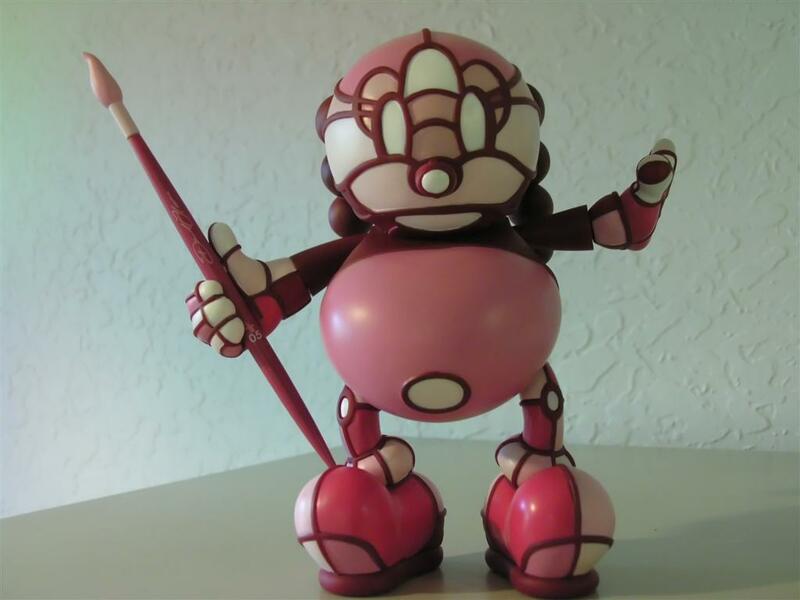 The borders separating the various colored segments that make up Kon Artis are raised vinyl rather than simply painted on. This detail gives the figure an appealing 3D texture which is particularly striking on the hands where it almost reminds me of “webbing”. Additionally the braids (or are they dreds) and the paintbrush accessory enhance the shape and profile of the figure. While Kon Artis is available in three colorways, each relies on complimentary shades of one dominant color: red, green, and blue. The red one I reviewed varies from a deep magenta to a very pale pink in a mosaic of color that is quite nice. So you've seen the pictures of Sket One's dope 20-inch King Tut custom that he did way back (lol) in 2004 for the Dunny Show in NY. 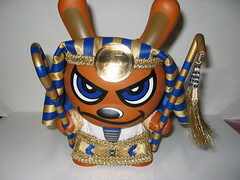 Now, that design can be yours with the upcoming 8" King Tut Dunny from Kidrobot. Ever wonder where the inspiration for the King Tut design came from? 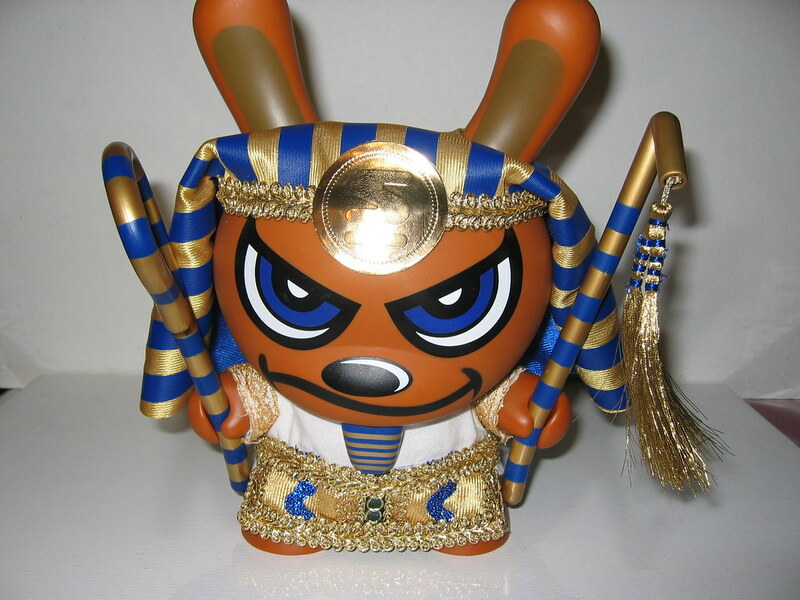 Well, Sket felt that the 20" Dunny was the King of Dunnys, and saw Tut as the King of kings and there you have it :-) This one comes in a standard blue and gold design (2000 pieces - 1.05.06) and a much rarer KR online exclusive black/red variant (200 pieces - 12.29.05). Each edition will retail for $39.99. Thanks to the very cool people at Kidrobot, we recently had a chance to take an extended look at the blue and gold edition of this very cool Dunny. The first impression out of the box is well... WOW. If you haven't been following the development of this one you might be wondering, does it have all the clothes and accessories that the original 20" custom had? In a word, yes! The blue and gold headress is amazing. It's quite large and flows nicely around the Dunny's ears and down the sides of the head. The weight of the fabric is nice too, not paper thin by any means. The shirt/tunic (ok, my knowledge of egyptian clothing terms is lacking!) seems quite close to the original and is attached with velcro. The accessories are quite cool and include the traditional crook and flail that typically is seen in drawings of the famous boy Pharoah, King Tut. These fit easily into the Dunnys hands and look pretty damn cool. 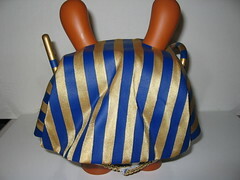 This is one decked out Dunny -- the overall matching blue and gold visual motiff is quite stunning. The overall design is a nice contrast between the majesty of a bygone era and an almost sly, in your face attitude. 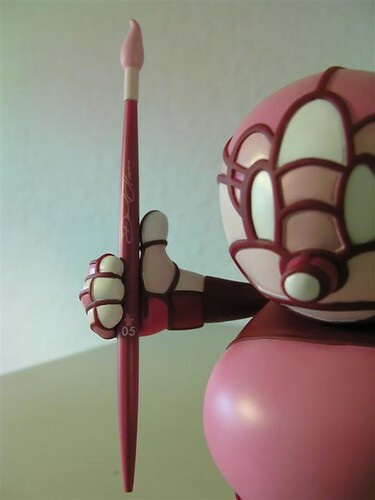 Props to Sket for the original design and for all the work he and KR put in to faithfully shrinking it down onto the 8" Dunny canvas. While I don't do rankings or ratings per se, I certainly recommend the 8" Blue King Tut Dunny as a worthy edition to any Dunny lover's collection. Egg Drop Ajaja is a part of David Horvath's deliciously askew and sarcastic universe. His various Dunnys are not isolated designs, but rather characters intertwined in a battle of good vs. evil (or something like that). 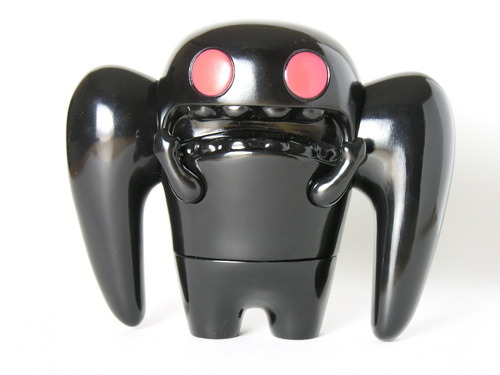 So to set the table, Mothman is Mr. Evil and Little Inky is minion number 1. Wonda, the intrepid photographer, is on his quest to defeat Mothman. To do so, he enlists the help of Brad Luk (Horvath's humor strikes again!) who discovers a green egg which turns him into Egg Drop Ajaja, the nemesis of Little Inky. Of course this force of good doesn't remain unchecked. No sir, enter the evil Ajaja (blue). 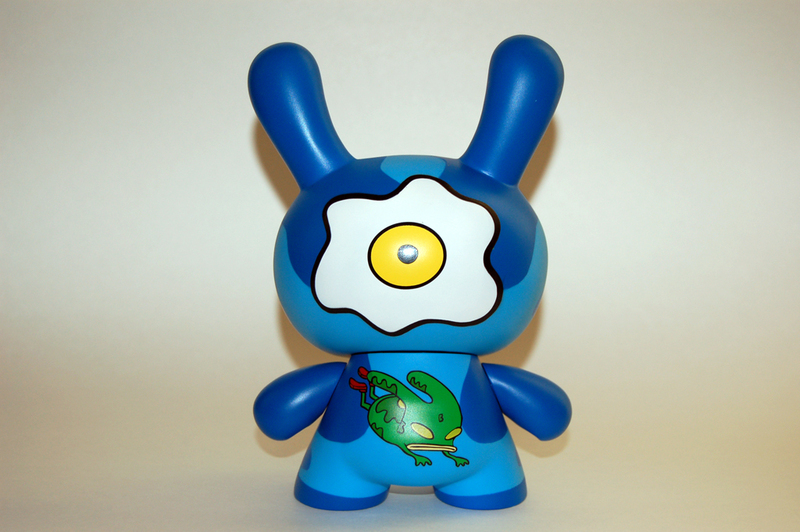 The backstory tieing the characters and designs together makes collecting Horvath's Dunnys more fun and meaningful. Case in point, the Blue Egg Drop Ajaja bears the signs of Little Inky's evil presence. Little Inky's manipulation shows through as his eyes and mouth(s) can be clealry seen on the evil Ajaja's ears. 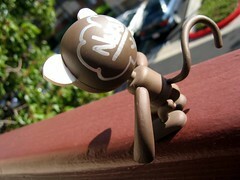 This apsect of the design is more than simply a visual homage to a previous Dunny. Little Inky's cameo on the Evil Ajaja marks the character squarely in the evil camp and points to the larger battle at hand. 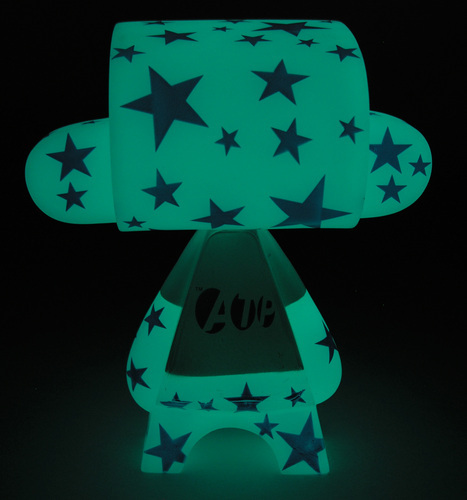 Other than the color, the ears the are main visual difference between the Blue and Green Egg Drop Dunnys. Oh, and guess which is more limited? Want a hint? Everyone loves evil! Ok, fine -- Evil Ajaja (blue) is limited to 600 pieces and the ?heroic? or is that unwittingly heroic Green Eggdrop Ajaja is limited to 2000 pieces. 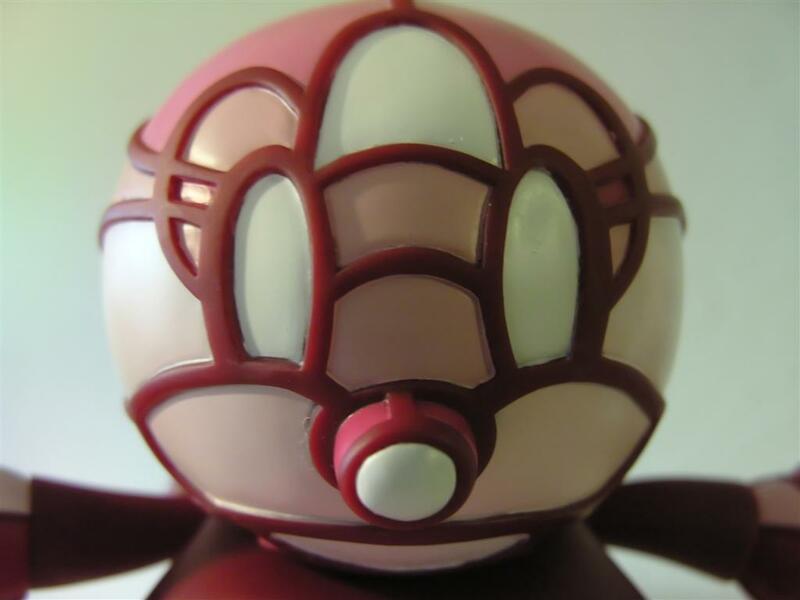 The overall design of both Egg Drop Dunnys is pure Horvath. 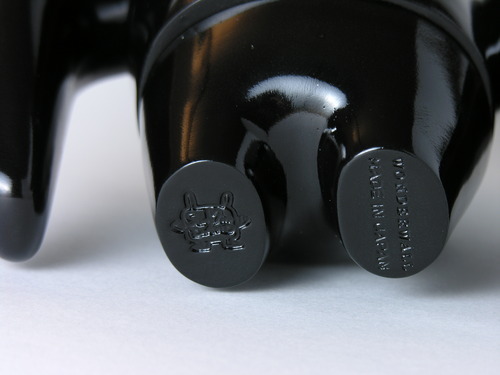 One look at these Dunnys reveals the creator. While some collectors bemoan visual familiarty as a sign of waning imagination, it is often the sign of a honed style and meticulously (heh) planned universe. The Egg Drops exude cool and happiness at the same time. It's hard to look at splattered egg on a Dunny and not laugh out loud -- at least once! 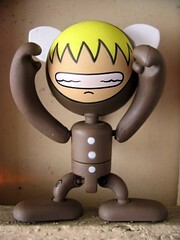 The Funny Club is a highly-articulated mini-sized designer toy created by Taiwanese designer b.b. birdy. 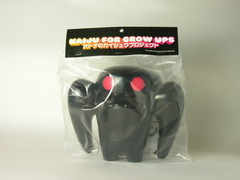 Several editions exist including the DIY Versions (Black and Whilte), Jack (Skull design -- Silver or Glow-in-the-Dark), Misfits of Nakanari. 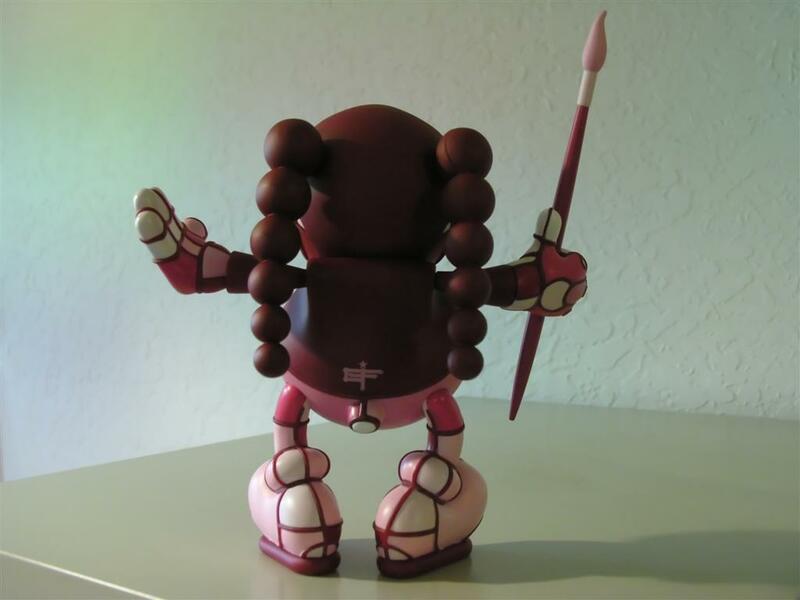 This mini-review is based on the brown "Nari" figure which is one-half of the "Mistfits of Nakanari" series featuring designs by Tony "Naknanari". The other being the cute blue "Naka". The Funny clubs are not as well known as many other popular mini-figures but I think most of this is due to comparably little exposure state-side. The FC figures stand about 3 and a 1/4 inches tall. I'm not sure what the SRP is, but I purchased "Nari" for $15 online which considering the tremendous articulation and high production values, seems like a reasonable price. They have a large round head, a segmented cylindrical body, large curved arms, and short legs with oversized feet. The main body swivels at the midway point which allows for some funky action poses and perhaps a variant on the "Exorcist" swiveled-head look! The "Nari" figure has a cool paint job -- the face has spikey blond hair and looks to be sporting a sort of stylish visor over his eyes. The overall shape of the Funny Club platform has a clean design and an undeniable sense of cuteness and playfulness. The quality seems to be quite high. The paint job is quite nice with very few (if any) rough spots or blemishes. The detail on Nari's face seems very very slightly fuzzy but it's a very minor issue in my book. The overall quality is definitely on par to what I would expect from a $15 toy. I should mention that the ball-pin joints used in this figure do seem to have some angles in which the limbs lose tension and feel a little limp --however this seems like a small tradeoff for the articulation acheived through this arrangment. After a few minutes of play, it becomes really clear that beyond the cool design elements, the key feature of this toy is the tremendous articulation acheived through a simple pin-based ball joint. The head, arms, and legs are all connected in such a manner which allows for a VERY wide range of motion. Also these articulated pieces move quite readily, unlike the arms and head on more static pieces like Dunnys and Qees. Additionally these pieces can be easily removed and if desired, mixed and matched with components from other figures in the Funny Club line which all share the same basic platform. The high-degree of articulation allows one to pose the figure in lots of evocative poses which I think allows a greater "connection" to the toy -- change the pose from day to day to fit your mood if you like. In fact, in many ways the FC's are a nice blend of designer toy and action figure. They lend themelves to both delicious eye candy on a shelf or in a nice glass case but also to more active forms of play. As you can see, from the shots below, I had lots of fun with "Nari"!